Recently, Freecharge rolled out its Go MasterCard feature – a revolutionary way to shop online. By far, it’s the most secure & safest way of transacting on thousands of online shopping sites like Paytm, Flipkart, Snapdeal etc. Not just that..The sites which accepts payment via credit card, all those are supported by this Go MasterCard. Still wondering? Yes, it’s true! Now you don’t need to carry your credit card every time while making payments. Everything is now virtual! Moreover, it’s absolutely free! No fees and No registration charges.. 🙂 Want to know how? Then just go through this article. 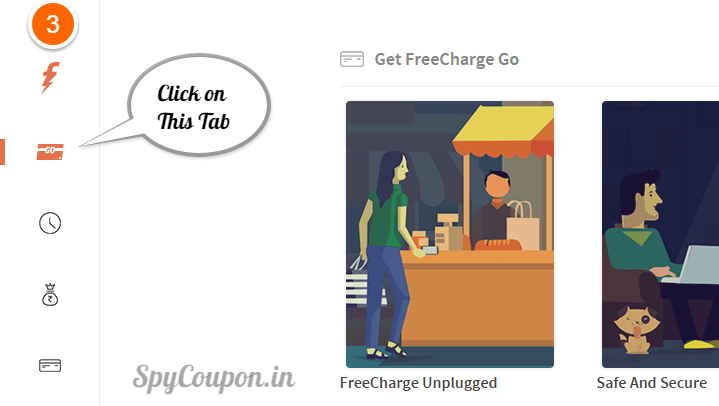 How to Activate Freecharge Go MasterCard? 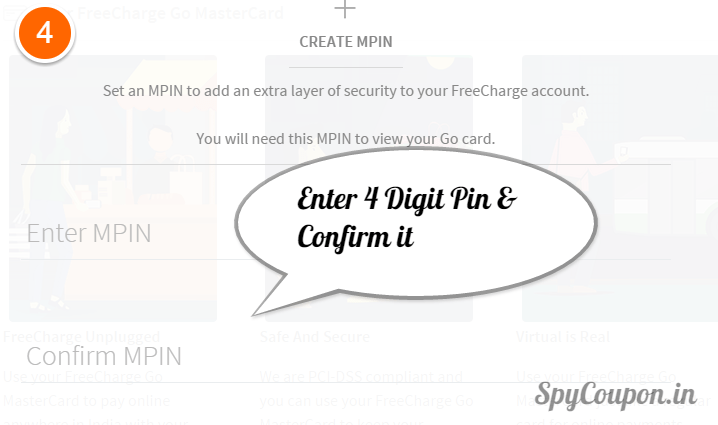 1] Login to your freecharge account. 2] Click on “account” tab as shown below. 3] Now as shown in the screenshot below, click on small “credit card icon”. 4] Enter any 4 digit pin and don’t disclose it to anyone. Re-enter pin again for confirmation. 5] Now, freecharge will create a unique virtual credit card for you! 🙂 Enjoy! Is this card really useful for me? 1] Right now, freecharge is giving lots of cashback on mobile, dth recharges. This cashback is added into users account in the form of FC credits. Earlier, recharging was only option for consuming those credits. But from now onward, you will be able to use that amount for making purchases on several other sites like Flipkart, Foodpanda and many others. That’s really a great initiative by freecharge. 2] Now you don’t need to worry anymore about online transactions. It’s quick safe & secure. 3] You might be knowing that Snapdeal and freecharge wallet are now combined. So, you can easily utilize the money earned from Snapdeal referral program as a real cash. 1] Shop on any website like flipkart, amazon, snapdeal, paytm and proceed to checkout. 2] Choose credit card gateway. 3] Enter 16 digit number of your Gomaster card & M-pin. 4] Verify otp which is sent to your registered mobile number. 5] Congrats! 🙂 Your order will be placed in expense of freecharge wallet credits. 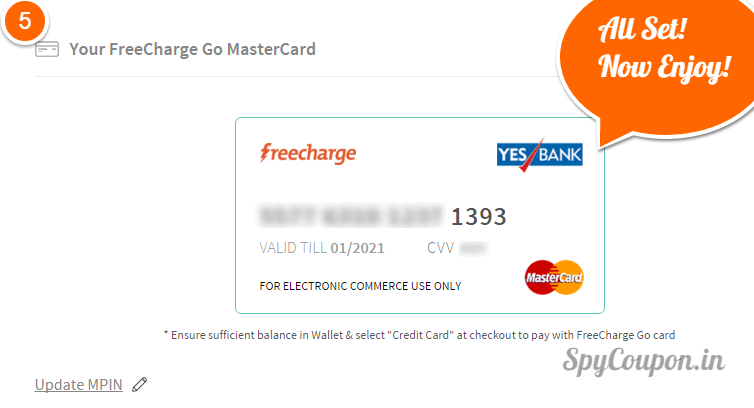 Freecharge told me that now we cant shop on amazon or other ecommerce site using go master card is it true ? We can but only on selected sites. If I were you, I would have purchased Amazon gift cards through some third party sites like GiftXoxo etc using Freecharge Go Master Card. Then I would have redeemed it at Amazon. Little twist, but it works for sure! There is no option in my phone of credit card ?? Why? Is this available only in pc?? At this moment, you can only activate card via desktop version.